The Christ in Prophecy Journal: Why Haiti? The massive magnitude-7.0 quake flattened the capital of Port-Au-Prince, leveling everything from neighborhoods, hospitals, schools, cathedrals, the main prison and even the president's palace. An uncountable number of people lay buried among the rubble, from public figures such as the head of the U.N. peacekeeping mission and the Roman Catholic archbishop, to little children in the arms of their parents. 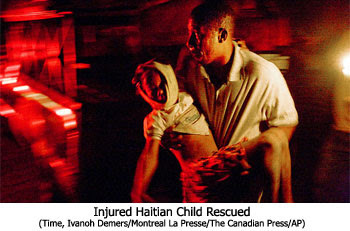 The number of dead cannot even begin to be known until the rescue crews gathering from all over the world arrive and begin their rescue efforts, but the numbers could very well be as Haitian Leading Sen. Youri Latortue told the Associated Press ("Thousands feared dead in Haiti quake; many trapped," Tues., Jan. 13, 2009, Jonathan M. Katz) — that 500,000 could very well be dead. 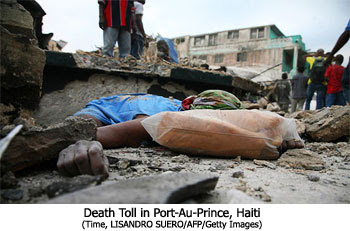 "Death was everywhere in Port-Au-Prince. Bodies of tiny children were piled next to schools. Corpses of women lay on the street with stunned expressions frozen on their faces as flies began to gather. Bodies of men were covered with plastic tarps or cotton sheets.... Parliament has collapsed. The tax office has collapsed. Schools have collapsed. Hospitals have collapsed... Even the main prison in the capital fell down." 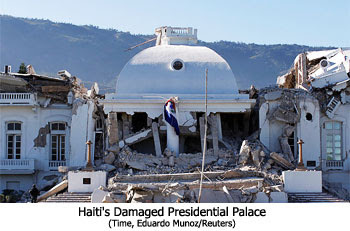 As horrible as the tragic earthquake in Haiti has been, it hasn't been the first major earthquake in 2010. Just a week earlier the Solomon Islands were rocked with a series of quakes, the greatest a magnitude-6.2. The U.S. Geological Survey's Latest Earthquakes M5.0+ in the World website reports a long series of 5.0 or higher earthquakes, ranging from Tonga to Java to Taiwan to Haiti and to just off the California coast (a magnitude-6.5). Because of our rejection of God and His moral standards, we tragically are the ones truly responsible for these natural disasters. As long as the nations continue to reject God, He will use natural disasters to yell — "I love you! Repent and come back to me!" We are tempting Him to move us from judgment to destruction. Our God is so merciful. He is patiently sending us one natural disaster wake-up call after another because He never pours out His wrath without warning. And the greatest "coming wrath" already visible on the far horizon is the 7-year Tribulation (1 Thes. 1:10), which will include two of the worst earthquakes the world will ever experience. And so, we each need to repent individually for our own rebellion and selfishness. We need to repent nationally for removing God from our society, for our murders from the womb to the elderly, for our obsession with sexual promiscuity, for our fascination with the occult, and for our lack of support for Israel's right to exist. We need to accept Jesus as our Savior, the only way we will be rescued from the "coming wrath." I'm not disputing geological statistics BUT we are NOT feeling it in Souther California - actually just the opposite. Geologist say that the moderate ones help relieve pressure. If that ain't happening...get ready [as if anyone can] for a big'un! Rev.3:9 Indeed I will make those of the synagogue of Satan, who say they are Jews and are not, but lie--indeed I will make them come and worship before your feet, and to know that I have loved you. PS I agree with this article, I have said as much over the snow here in the U.K. The E.U. is poking a finger in the apple of God's eye - Israel, and more beside. hartdawg - I left a follow-up to your "...NOT a new doctrine"
There's plenty of truth out there if any really want to find it! ...rock-throwers... Humph! You axed if any of us was up on "climate change"... Phil Brennan @ NewsMax.com started using the term "Globaloney" [GB] back in '04-'05 so I have a file directory with that name for any 'GB' articles that catches my eye. WorldNetDaily.com [which BTW holds the record for the highest number of 'sticky hits' of any news sites in the world for several years running] has a cute bumper sticker that says "Climate Change?" & shows the symbols for the 4 seasons -- Yeah, it "changes"... exactly 4 times a year... like clock-work... and year after year to boot! I read your post, and DrNoFog's, response to it.....in regards to the moderate quakes. Better hold on out there! I have a few relatives that live out there. One aunt who is in her early 80's but as sharpe as tack, and Loves the Lord.....she thinks one could happen any day.....THE BIG ONE! "why did such a violent earthquake on the island, only devestate half of the Island...the Haiti part, and not the Dominican Republic part". This may be a bad sign - pressure building up, or a good sign - perhaps the 1994 Northridge quake release a lot of pressure (it was a very strong shaker). But that's the way it is with our quakes - you never know. Hopefully I won't have to follow up on that one part and say I'm okay - hopefully we'll be raptured before the next big one. Same goes for you.....if you have one, please send us a message, as we will be worrying about cha. Wow............Fox News just reported that another earthquake has just hit! A 5.7 in Venezuela! Me and my mom REALLY wanna go down to Haiti! If I was old enough, we would join the Red Cross! But I guess we couldn't leave Kenny at home because Dad needs to work and Grandma can't watch him 'cause of cancer... But IF we could, WE WOULD!! Come on over Ven.....we would love to see you join us in the facebook group!! Regardless of man's opinion--God's judgment of Haiti, and other nations is an act of righteousness. And these are only the beginnings of the birth pangs of the coming New Heaven & New Earth. I repeat--REPENT and seek Christ, who paid our sin debt and makes the only way to God. 2 Peter 3:9 is a reference to the second death... going to Hell. If God didn't want anyone to die on earth itd be pretty filled up by now with reaaaaallly old people! Wonderfully, reports are streaming in from Haiti about spiritual revival. That's what this is all about - the saving of souls.